LRs-Linux was based upon Linux From Scratch (LFS). In contrast to LFS and most common distros, LRs Linux has the ability to compile directly from the CD. This means that binaries can be natively compiled for the target host during the install, enhancing the performance of the resultant system. The install process was largely automated. Rate this project Version 2.3.4 of pfSense, a specialist FreeBSD-based operating system designed for firewalls and routers, has been released: "We are happy to announce the release of pfSense software version 2.3.4. This is a maintenance release in the 2.3.x series, bringing stability and bug fixes, fixes for a few security issues, and a handful of new features. On the 2.3.4-RELEASE Dashboard you'll find a few additional pieces of information - the BIOS vendor, version, and release date (if the firewall can determine them) and a Netgate Unique ID. The Netgate Unique ID is similar to a serial number, it is used to uniquely identify an instance of pfSense software for customers who want to purchase support services. For hardware sold in our store, it also allows us to tie units to our manufacturing records. This ID is consistent across all platforms (bare metal, virtual machines, and hosted/cloud instances such as AWS/Azure). We had originally intended to use the hardware serial number or the UUID generated by the operating system, but we found that these were unreliable." See the release announcement and release notes for further details. Download: pfSense-CE-2.3.4-RELEASE-amd64.iso.gz (306MB, SHA256), pfSense-CE-2.3.4-RELEASE-i386.iso.gz (290MB, SHA256). pfSense is a free, open source customized distribution of FreeBSD specifically tailored for use as a firewall and router that is entirely managed via web interface. In addition to being a routing platform, pfSense includes a long list of related features and a package system which allows further expandability. Jim Pingle has announced the availability of pfSense 2.4.4. The new release of the pfSense operating system for routers and firewalls is based on FreeBSD 11.2 and offers several new features: "2.4.4 includes a number of significant new features: OS Upgrade - base Operating System upgraded to FreeBSD 11.2-RELEASE-p3. As a part of moving to FreeBSD 11.2, support is included for C3000-based hardware. PHP 7.2 - PHP upgraded to version 7.2, which required numerous changes to syntax throughout the source code and packages. Routed IPsec (VTI) - routed IPsec is now possible using using FreeBSD if_ipsec(4) Virtual Tunnel Interfaces (VTI). IPsec Speed Improvements - the new Asynchronous Cryptography option under the IPsec Advanced Settings tab can dramatically improve IPsec performance on multi-core hardware. Default Gateway Group - the default gateway may now be configured using a Gateway Group setup for failover, which replaces Default Gateway Switching. Limiter AQM/Queue Schedulers - limiters now include support for several Active Queue Management (AQM) methods and Queue Scheduler configurations such as FQ_CODEL." Further details can be found in the project's release announcement and in the release notes. 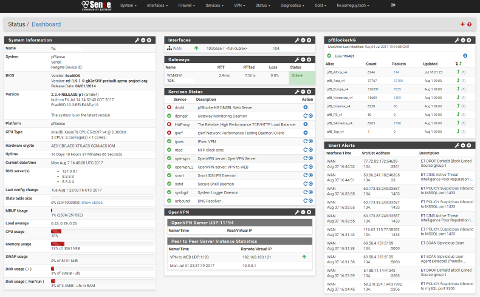 Download: pfSense-CE-2.4.4-RELEASE-amd64.iso.gz (326MB, SHA256). Jim Pingle has announced the release of pfSense 2.4.3, the latest update of the specialist FreeBSD-based operating system for firewalls and routers: "We are excited to announce the release of pfSense software version 2.4.3, now available for new installations and upgrades. pfSense software version 2.4.3 brings security patches, several new features, support for new Netgate hardware models, and stability fixes for issues present in previous pfSense 2.4.x branch releases. This release includes several important security patches: kernel PTI mitigations for Meltdown; IBRS mitigation for Spectre V2 (requires updated CPU microcode); fixed three potential XSS vectors and two potential CSRF issues; CSRF protection for all dashboard widgets; updated several base system packages to address CVEs. In addition to security fixes, pfSense software version 2.4.3 also includes important bug fixes." Read the rest of the release announcement for a full changelog and upgrade instructions. Download: pfSense-CE-2.4.3-RELEASE-amd64.iso.gz (305MB, SHA256), pfSense-CE-memstick-serial-2.4.3-RELEASE-amd64.img.gz (306MB, SHA256). pfSense is a free, open-source customised distribution of FreeBSD specifically tailored for use as a firewall and router that is entirely managed via web interface. Jim Pingle has announced the release of pfSense 2.4.0 which uses FreeBSD 11.1 as the base operating system and supports running on ZFS. "We are excited to announce the release of pfSense software version 2.4, now available for new installations and upgrades! pfSense software version 2.4.0 was a herculean effort! It is the culmination of 18 months of hard work by Netgate and community contributors, with over 290 items resolved. According to git, 671 files were changed with a total 1,651,680 lines added, and 185,727 lines deleted. Most of those added lines are from translated strings for multiple language support. Version 2.4.0 includes a long list of significant changes in pfSense software and in the underlying operating system and dependencies. Changes for pfSense 2.4.0 include: FreeBSD 11.1-RELEASE as the base operating system; new pfSense installer based on BSDInstall, with support for ZFS, UEFI and multiple types of partition layouts (e.g. GPT, BIOS)...." The 32-bit build of pfSense is no longer available in the 2.4 series. The release announcement offers further information. Download (SHA256): pfSense-CE-2.4.0-RELEASE-amd64.iso.gz (300MB). Jim Pingle has announced the release of pfSense 2.3.3, an updated build of the FreeBSD-based specialist operating system designed for firewalls and routers: "We are happy to announce the release of pfSense software version 2.3.3. This is a maintenance release in the 2.3.x series, bringing numerous stability and bug fixes, fixes for a handful of security issues in the GUI, and a handful of new features. The full list of changes is on the 2.3.3 New Features and Changes page, including a list of FreeBSD and internal security advisories addressed by this release. As always, you can upgrade from any prior version directly to 2.3.3. The Upgrade Guide covers everything you'll need to know for upgrading in general. While, nearly all of the common regressions between 2.2.6 and 2.3-RELEASE have been fixed in subsequent releases, the following still exist: IPsec IPComp does not work, this is disabled by default; IGMP Proxy does not work with VLAN interfaces and possibly other edge cases; those using IPsec and OpenBGPD may have non-functional IPsec unless OpenBGPD is removed." Continue to the release announcement for more information. Download: pfSense-CE-2.3.3-RELEASE-amd64.iso.gz (307MB, SHA256), pfSense-CE-2.3.3-RELEASE-i386.iso.gz (292MB, SHA256). Chris Buechler has announced the release of pfSense 2.3.2, a new stable version in the 2.3 branch of the project's FreeBSD-based operating system for firewalls and routers: "We are happy to announce the release of pfSense software version 2.3.2. This is a maintenance release in the 2.3.x series, bringing a number of bug fixes. It includes fixes for 60 bugs, 8 features and 2 to-do items completed. As always, you can upgrade from any prior version directly to 2.3.2. While nearly all of the common regressions between 2.2.6 and 2.3-RELEASE have been fixed in subsequent releases, the following still exist: IPsec IPComp does not work and is disabled by default, however in 2.3.1 it is automatically not enabled to avoid encountering this problem; IGMP Proxy does not work with VLAN interfaces and possibly other edge cases, this is a little-used component; those using IPsec and OpenBGPD may have non-functional IPsec unless OpenBGPD is removed." Here is the full release announcement, with further information available on the features and changes page. Download: pfSense-CE-2.3-RELEASE-amd64.iso.gz (297MB, SHA256), pfSense-CE-2.3.2-RELEASE-i386.iso.gz (282MB, SHA256). Chris Buechler has announced the release of pfSense 2.3.1, an updated version of the project's FreeBSD-based operating system designed for firewalls and routers. This is minor bug-fix release, although it also includes a number of important security updates: "We are happy to announce the release of pfSense software version 2.3.1. This is a maintenance release in the 2.3.x series, bringing a number of bug fixes, two security fixes in the GUI, as well as security fixes for OpenSSL, OpenVPN and FreeBSD atkbd and sendmsg. This release includes a total of 103 bug fixes. 79 regressions in 2.3 have been fixed, mostly minor issues in the new GUI. Several of these are significant issues, and have resolved nearly all the post-upgrade problems encountered in 2.3-RELEASE. 24 issues affecting 2.2.x and prior versions have also been fixed." Read the release announcement and check out the features and changes page for further information. Download: pfSense-CE-2.3-RELEASE-amd64.iso.gz (296MB, SHA256), pfSense-CE-2.3.1-RELEASE-i386.iso.gz (281MB, SHA256). Chris Buechler has announced the availability of pfSense 2.3. The new release of this FreeBSD-based firewall operating system includes a number of new changes to its web interface and fixes several bugs from previous releases. 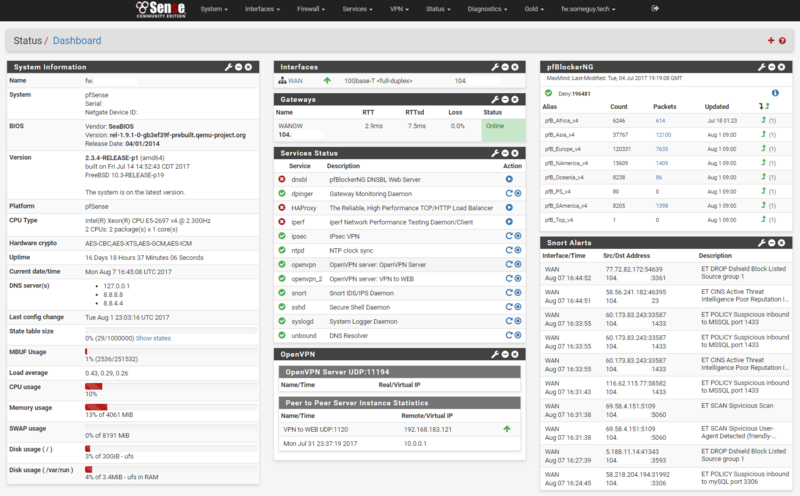 "We are happy to announce the release of pfSense software version 2.3. The most significant changes in this release are a rewrite of the webGUI using Bootstrap, and the underlying system, including the base system and kernel, being converted entirely to FreeBSD pkg. The pkg conversion enables us to update pieces of the system individually going forward, rather than the monolithic updates of the past. The webGUI rewrite brings a new responsive look and feel to pfSense requiring a minimum of resizing or scrolling on a wide range of devices from desktop to mobile phones. For the highlights, check out the features and highlights video. Past blog posts have covered some of the changes, such as the performance improvements from tryforward and the webGUI update." Further information can be found on the project's features and changes page. Download: pfSense-CE-2.3-RELEASE-amd64.iso.gz (296MB, SHA256). Chris Buechler has announced the launch of a release candidate for pfSense 2.3. The development snapshot is available for testing and features a number of important changes, particularly with regards to package management: "We are proud to announce pfSense software version 2.3 Release Candidate is now available! The most significant changes in this release are a rewrite of the webGUI utilizing Bootstrap, and the underlying system being converted entirely to FreeBSD pkg (including the base system and kernel). The pkg conversion enables us to update pieces of the system individually going forward, rather than the monolithic updates of the past. Further information can be found in the project's release announcement and Features and Changes document. Download: pfSense-CE-2.3-RC-amd64.iso.gz (296MB, SHA256).